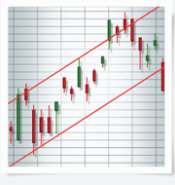 Technichal Analysis and Line Studies are two tools used by professional analysts to both identify and confirm share market trends. For most investors it is only a matter of time before the realise that identifying the peaks and troughs of a stock or industry sector can be the most difficult job. In the long term it requires more than just luck and hunches. 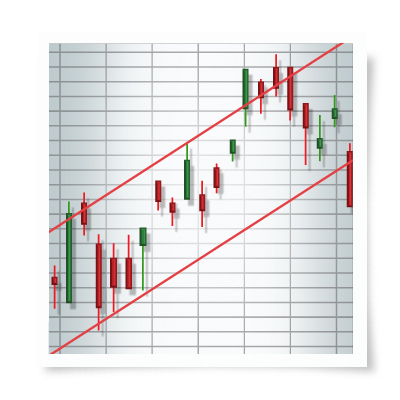 Line studies allow you to predict where a stock or the market may rise or fall. They are usually used in conjunction with other indicators to confirm entry or exit points into the trend. Level - Quadrant Lines and Tirone. As with the Technical Indicators, Line Studies are customisable and allow you to set and save the analysis how you want. In the context of technical analysis, an indicator is a mathematical calculation based on a securities price and/or volume. Some, such as moving averages, are derived from simple formulas while others, such as Stochastics, have complex formulas and require more study to fully understand. Regardless of the complexity of the formula, technical indicators can provide unique perspective on the strength and direction of the underlying price action and the prediction of early rising and falling trends. Beyond Charts includes a plethora of technical indicators that can be inserted or overlayed directly onto the chart. Each indicator can easily be applied using the indicators default setting or customised to user’s specific trading style. The Indicators in Beyond Charts really have been designed with the user in mind, allowing for a smooth experience within a user friendly environment. You can save layouts, customise the charts and run analysis the way you like to trade. For a full list of Indicators please see the list below.